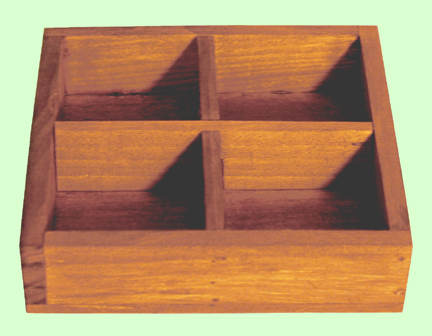 This wood basket is divided into four sections. It measures 5" square, 1.25" deep . The dimensions are outside measurements. It is available in the Garden colors. The sample basket is finished in Matt Brown. This item is also available in two larger sizes. Please click on item F3096 or item F3098 to view these sizes.